Category: Where’s the good coffee? August 4, 2008 August 7, 2008 Patrick Food, Restaurants, UK Life, Where's the good coffee? I just got back from lunch there today and was overall very impressed. They don’t have a huge variety of food with today’s offerings limited to a number of sandwiches and stuffed croissants, ranging between £3.5-£5. A toasted vegetarian sandwich with some brie/pumpkin and sweet chilli sauce went down a treat with a creamy flat white coffee. Like their sister restaurant, Milk Bar has a couple of benches outside and with their wide awning makes it easy to sit outside, regardless of the rain beating down (though the wind might get you). Inside they have about ten or twelve tables in a dark, modern and sparse interior only decorated with a handful of small hangings. The attendants were warm and courteous, telling us what they served and patient as we made up our minds. Most importantly, the coffee was extremely well made with the decorative leaf pattern drawn into the top with the rest of the creamy foam. A flat white sitting down costs £2.50 and they have different sizes with difference prices if you decide to have it to go. I wonder how busy this places gets in the morning as I’m not confident they’d be much standing space for ordering and picking up coffees. Highly recommended for a great place and a decent coffee. April 6, 2008 Patrick Canada, Food, Restaurants, Where's the good coffee? Is surprisingly better than I expected. The standard Canadian drink of choice tends to be the filtered variety supplied by the mega chain named after ex-ice hockey star, Tim Horton. It’s still not the type of stuff I really want to drink though I have been challenged to the large double double at some stage. 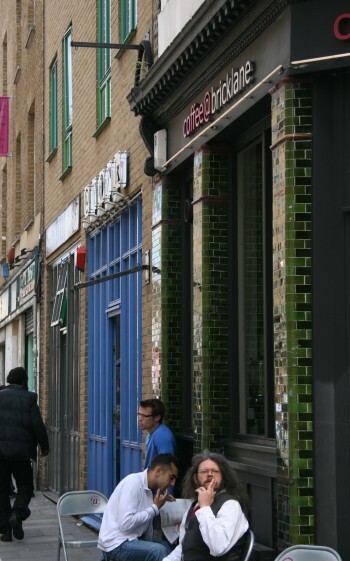 February 22, 2008 February 22, 2008 Patrick Food, UK Life, Where's the good coffee? I’ve been meaning to go to this little cafe for some time, and it was only recently with some Italian colleagues of mine that we visited here. Voted as the best coffee store by Time Out one year, I’m surprised this coffee shop isn’t as busy as other places. Like most other coffee stores in London, this store doesn’t have much space for staying with a few small tables and chairs ideal for a few people catching up. The main attraction here is the coffee bar, complete with one of the best looking Elektra machines I’m yet to see. Like most of their other machines, this Elektra espresso machine is made out of shiny sleek silver, brightly polished. 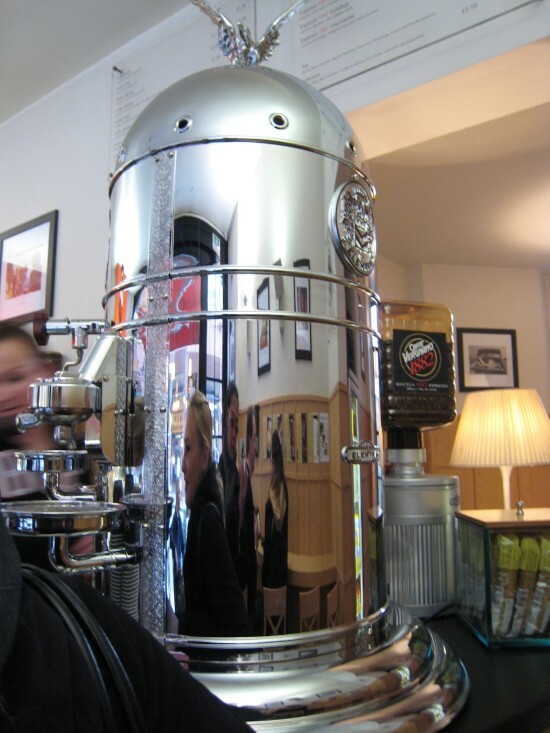 This particular machine is much taller than other espresso machines, with an a matching silver eagle mounting its peak. Three spouts extend out of its circular sides onto tiny little platforms, drawing the luxurious black liquid into whatever receptacle that sits below. In true Italian fashion, we ordered an espresso each, served on a small pewter train and accompanied by a small glass of cold water and an almond based biscuit – the perfect after lunch condiment. Of course, we drink this standing at the espresso bar. For those partial to the cappuccino, ask for the sprinkled chocolate dusted over their signature 1882 template. August 15, 2007 April 1, 2012 Patrick Food, UK Life, Where's the good coffee? This awesome little coffee store is easy to miss despite its location in the middle of Soho just because it sits behind all the stalls along the Berwick Street Market. Its suitably dark interior invites the coffee aficionado inside to sit at one of the small tables, or rest and gaze out into the world at through the window. If you’re more inclined to be seen people watching, they also offer a couple of benches outside. Asking for a Flat White anywhere but Australia and New Zealand is guaranteed to bring a look of confusion as it’s a style of coffee that hasn’t yet been embraced by the rest of the world. Unsurprisingly then this store, initially setup to educate the rest of the world (or at least London) about better coffee, now attracts local and Antipodeans alike (both in front and behind the coffee bar). Besides really good coffee, they also sell plenty of other items, including your standard pastries, cakes and sandwiches. Better yet they also have a small fridge out back that sells one of my favourite Italian soft drinks, Chinotto, a bitter citrus flavoured drink. 1 Comment UK Life, Where's the good coffee? August 3, 2007 August 4, 2007 Patrick Food, UK Life, Where's the good coffee? One of my most favourite markets at the moment in London (and there are many of them – I found yet another one on Whitecross Street on Sunday) is Sunday Up Market. It’s great because it’s not as manic as Spitalfields yet and still has that bohemian feel that the East side markets have. One of the exits of this market falls against Brick Lane and at the junction of Brick Lane and Buxton Street you will find another great coffee house, Coffee @ Brick Lane. Like many of the other coffee houses I’ve added to the list, this one is also full of character but distinctly different with plush leather couches at the back, old and stylish rickety looking chairs and tables with a plethora of media including flyers, newspapers and various papers to keep you busy while you down your coffee. They have high ceilings giving the place a very open and airy feeling despite the number of people that flow in and out of the place. Outside they have numerous benches and chairs, most ideal for the opportune people watching moments during market times on Sunday. In terms of coffee they offer a wide variety of coffee, hot chocolate and teas and a much wider menu than your typical coffee store including soup, sandwiches and toasted foccacias. Like most other coffee stores though they also offer many grand looking cakes and pastries to accompany your coffee. Leave a comment Food, UK Life, Where's the good coffee? July 28, 2007 Patrick Food, UK Life, Where's the good coffee? Monmouth coffee is one of my most favourite places to drop in for a takeaway coffee with the benefit of being located just around the corner from my main work office in Covent Garden. 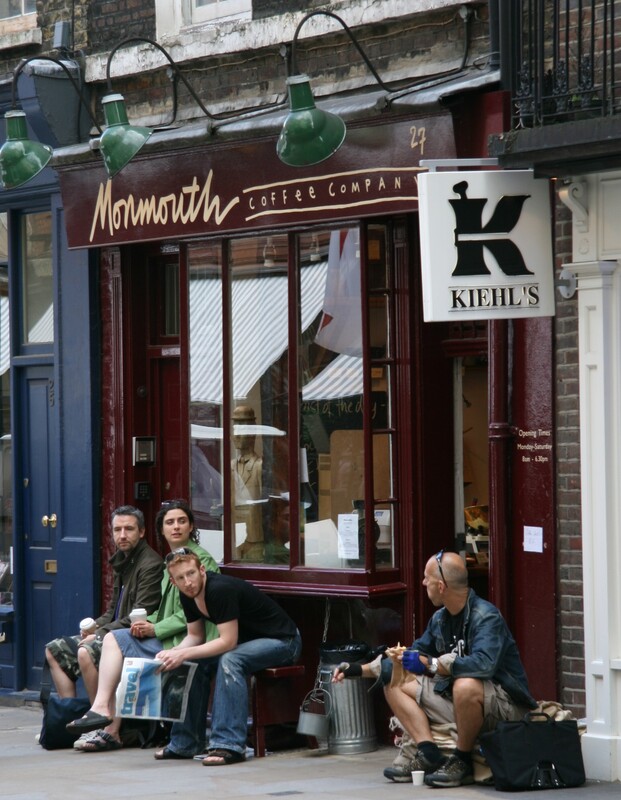 Their flagship store that just happens to be several years older than yours truly is located on Monmouth Street although they also have a store at the Borough, and a further stall inside the Borough Market. Their flagship store is tiny and for the most part, you end up sharing tables with other people but worth it for its unique atmosphere. I’ve found the staff seem to enjoy working there and have always been pretty helpful. That helps a lot when the store gets very busy, particularly on weekends when the line sometimes stretches onto the street. In terms of coffee, Monmouth only offers a single size for things like filtered coffee, americanos and lattes. 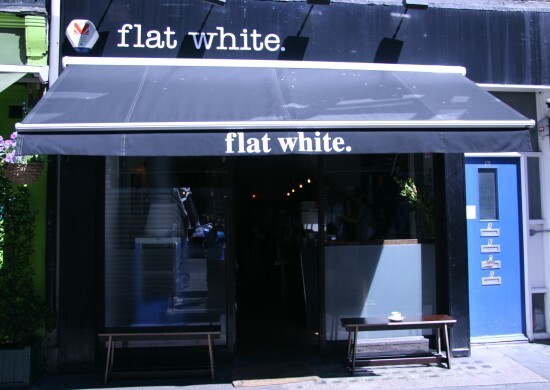 Within the last year, it also seems that one of their Antipodean staff has had quite an influence because they now offer a Flat White in addition to their normal drinks. When you pick up your take away coffee, the small stand next to that counter offers a small selection of things you can add to your coffee, including a bottle of milk if you desire a little bit more, or soft brown sugar if you want to make your coffee sweeter. If you happen to enjoy making coffee at home, Monmouth offers plenty of roasted coffee beans in a variety of forms for you to take home. I’ve found they make a great present for someone you know who enjoys their coffee. They also offer a mouth watering display of all types of cakes, pastries and baked savoury goods that go well with your coffee. Leave a comment Food, London-Coffee, UK Life, Where's the good coffee? July 22, 2007 July 22, 2007 Patrick Food, UK Life, Where's the good coffee? When I head to the markets in Angel on the weekend, I make sure that I stop by this ‘espresso emporium’ found on Upper Street. It’s got a great set up – some tables outside, a tall bar by the window to look out onto the world, and then a very roomy interior complete with a sunlight and free wi-fi. Everything looks purposefully retro-styled with a shiny metallic espresso machine pumping out all the orders. The coffee here is tasty with plenty of styles to choose from including your traditional espresso, americano, latte as well as the less mainstream macchiatos, and even the affogato. If you find yourself having a take away latte, you’ll only find your pocket a reasonable £1.90 lighter. 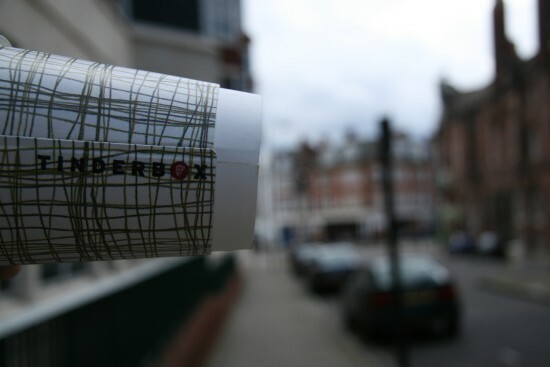 Though less important to the coffee, Tinderbox also offer a variety of sandwiches, soft drinks, pastries and cakes. Back home in Australia, Barista’s are generally a commodity and London could easily do with many more of them. Forget chain stores like Starbucks or Costa because I want to know more about the cafes that are worth going back to. I’m going to start writing about the best ones I find in London (since they’re so rare), so that you, too, can benefit from them. 6 Comments Food, UK Life, Where's the good coffee?